This one is hard to start...our faithful conpanion of 12+ years passed away this morning and it's just hard. 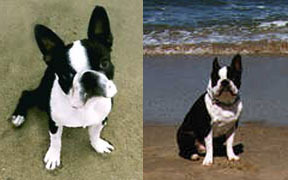 Albert, our "little-boy", our first "child", the robust and ultra-intelligent Boston Terrier passed quietly in our arms earlier this morning. There's no way to prepare for an actual event like this although we both know that it is just part of raising and enjoying dogs. The tears fell like rain, the wrenching pain of losing a friend was extant...we're in full grieving mode. It's natural, normal...it's sad. Albert was the best dog ever. Intelligent beyond belief (sometimes to his own detriment...the chocolate Easter egg incident comes to mind...), strong and muscular (one of many pet names we had for him was "Al-Dozer"), talented at obedience and agility competitions (he had several titles and awards), a finalist in the snoring championships in our bedroom (Jan started to wake up from *his* snoring instead of mine after a while and THAT is saying something), and just an all-around good natured dog that got along with everyone (it was always, "wanna play???" with Albert) and everything and provided precious moments and lasting memories that will last us a lifetime. I could hardly ask for more. We're sad now but things will get better - they always do - but right now, it's hard. We console ourselves with the fact that he's no longer suffering from the wasting effects of a long bout with Cushing's disease, a horrible, fatal disease that robs a body of it's tone and health, not suffering with one borderline eye and eyesight from an injury sustained last year, and just plain not suffering with being old and creaky. He has joined his "sister" Gypsy who passed away earlier this year. I have no doubt that they are playing "hall-ball" at this very moment, waiting for the right time when we will join them. Things are not hard there...they never are. Things are hard here...for the moment. We will always keep Albert in our heart and mind and be comfortable in the fact that the three of us provided equally for each other and made life for the past 12 years very special indeed.